The Canadian Society of Physician Leaders recently reviewed our book Stop Physician Burnout in their CJPL Journal ... in what I will characterize as glowing terms. 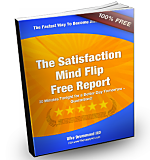 It is great to see an official review of a self-published book like ours. 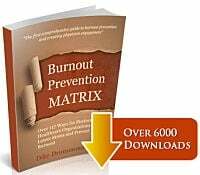 We have over 25,000 copies in print at this point, helping doctors around the world build their burnout prevention strategy. It is about time an official body of some kind recognized the value of this approach. Johny Van Aerde, MD, MA, PhD, FRCPC, past president of the Canadian Society of Physician Leaders and editor of the Canadian Journal of Physician Leadership. 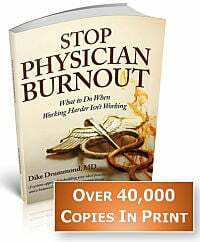 "Stop Physician Burnout is a good read and a useful handbook, not only for physicians, but also for those who live or work with them. The book dives into treatment, starting with taking out the “head trash” that prevents us from even starting to heal. That “trash” is a set of five changes in awareness that must be addressed to enable the burnout prevention tools to work. For example, Drummond explains how to deal with the omni-present inner critic. Another necessity is realizing that we are trained to approach everything as a problem that can be solved. 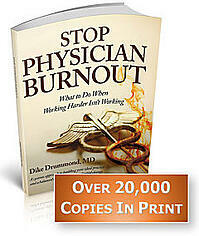 Unfortunately, burnout is not a problem for which there is one solution; it is a dilemma and dilemmas are managed. This topic is difficult to grasp for “experts,” but Drummond deals with it, nicely and comprehensively. After helping us develop a blueprint for our life, a vision of our future, Drummond elaborates extensively on a series of tools to prevent burnout. All are simple, some have been proven by research to be effective. He organizes them into a “burnout prevention matrix,” which has four categories: tools to decrease personal stress, tools for personal recharge, tools to decrease organizational stress, and tools to facilitate organizational recharge. Most important, each tool is usable and understandable, not only for those who want to prevent burnout, but also for those who are already experiencing it."